Powerful, long life battery and noise cancellation. Just about everything you would look for in a set of wireless on-ear headphones. The high-end audio company, Bang & Olufsen, has added a great new product to its line-up that delivers high quality audio and a go-to product for the audiophiles out there. The headphones are made of lightweight materials and offer a great fit. The sturdy quality and feel of them promises the wearer a long-lasting durability. Putting them to the test, they are very comfortable and light to have on making it easy to forget you are even wearing them. The battery life of these headphones is truly remarkable. Despite hours of use throughout the trial period, I didn’t even get close to using up the battery. The product vouches to have up to 30 hours of playtime and in no way falls short of delivering that. They headphone are easily adjustable too, allowing room for personal comfort and customization. In addition, a great feature they have are sensors in the band that automatically pause whatever you are listening to the moment you take them off! Beoplay have created a super handy app that runs you through the whole setup process. It’s best to start it up as you power up the headphones for the first time. It takes you through a quick and easy step by step process introducing you to all the tips and features you can take advantage of when looking to make the most of your headphones. A minor glitch I encountered during this process saw me go through the introduction three times, but that is an easy fix with an update of the app if it happens. For those that look for that extra bit of customisation when it comes to personalizing their music, the app offers “ToneTouch” – a great way to achieve that. While you don’t get the same level of customization as a mixing desk, it gives you a personalization of your music experience that can guide you through different tonality and staging settings to find the sounds that suits you. For the price of these select headphones, you would hope to have a product that would not only withstand the bag test, but also be portable and have a protective case. 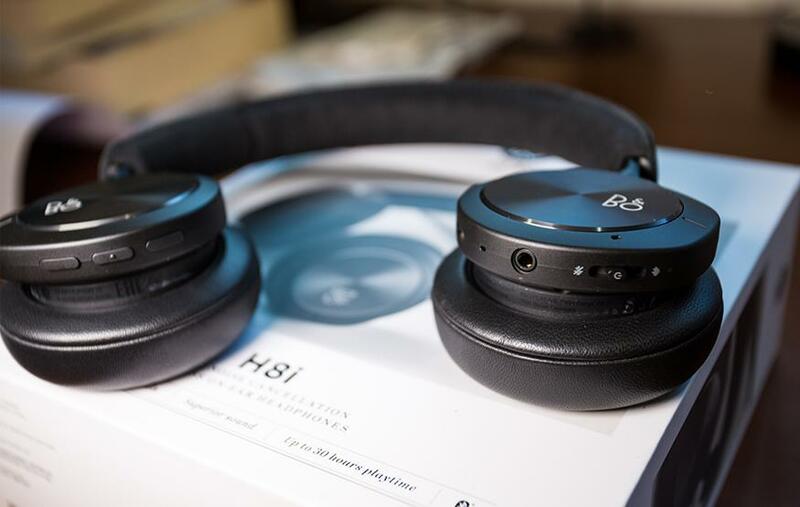 Upon unboxing them, two things stood out: Firstly, although they are very durable headphones, they don’t fold together to take up less room in the bag (not exactly the end of the world, as lots of competitors don’t fold down either). Secondly, they don’t have a heavy-duty protective case that gives you that extra layer of security when it comes to ensuring the safety of your newly purchased, and pricey, headphones. They do come with a soft protective case that could save it from a few nicks and scratches on the everyday commutes, but not quite the heavy-duty case you would hope for. If you are in the market to purchase some wireless noise cancelling headphones and feel stuck to make a choice, break it down to what you are looking for. When placed next to over-ear headphones, it has a lot of serious contenders that could put up a seriously tough fight, but a lot of people tend to get claustrophobic when they wear over-ear headphones which does play out in these headphones favour. However, when it comes to the playing field for on-ear headphones, these are definitely up the top with some customization and personalization to be the product you desire. Unfortunately, the price does make for a hard-selling point. The quality of the product is not to be doubted, but in relation to cost they seem to be on the more expensive end of the spectrum. The opportunity for great customization with active noise cancellation, along with the use of the ToneTouch in the BeoPlay app, places these headphones on a level that audiophiles will love. You won’t miss a beat with Beoplay’s H8i, as it covers the full range of frequency for the human ear. While at the time of writing this, there has not yet been a pricing released in Australia, internationally we are looking at €399, which would likely see these headphones sit in the $700 – $800 range. It does seem you are paying more for the brand rather than the product, but you do get a high end set of headphones that will last the stand of time.